Vacuum tubes, thermionic tubes or valves, electron tubes… The names are many, but the devices are the same. Invented more than a century ago, they are still used in the audio world because of their acoustic properties, while being supplanted half a century ago by the transistors in all other applications. The APPJ PA1502A is among the amplifiers currently in production to use tubes, and it uses tubes for both pre-amplification and output stages. With a reduced footprint and modern design, it delivers good sound at an affordable price. Disclaimer: I received the APPJ PA1502A as a free sample from Linsoul Audio. They sell it on AliExpress at ~$190. 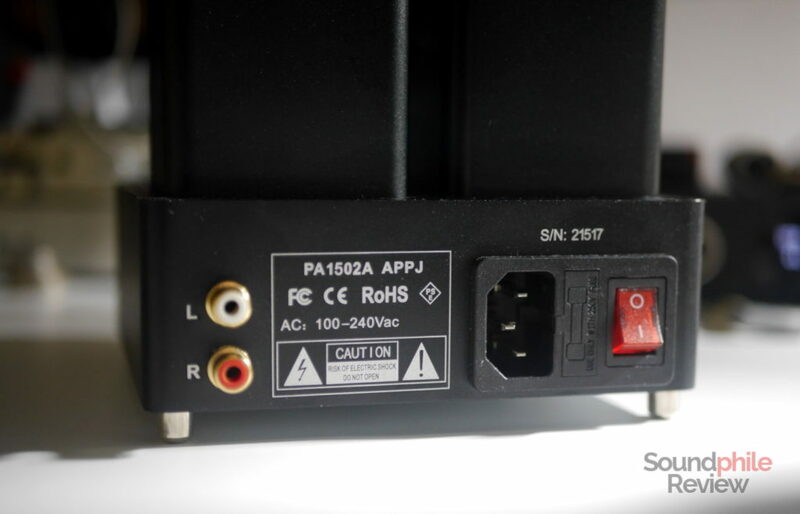 The APPJ PA1502A comes in a simple cardboard box which only contains the amplifier itself: nothing else is included in the package, not even the power cord. It really is barebone! The box is made to withstand the abuse of shipping companies, though, as it has a large amount of padding in it to keep the amplifier safe from harm – in fact it arrived completely intact. The APPJ PA1502A is really squared in its design. Everything has a squared appearance, save for the tubes and the volume knob, and it is this squareness – together with the matte black colour – that makes it appear modern. In fact the main body and the two “towers” where the transformers reside are both squared with rounded angles on the sides and flat top, and both are coloured in black, though they are two slightly different shades of black. Four bolts keep the top secured against the body, while four metallic feet do the same on the bottom. 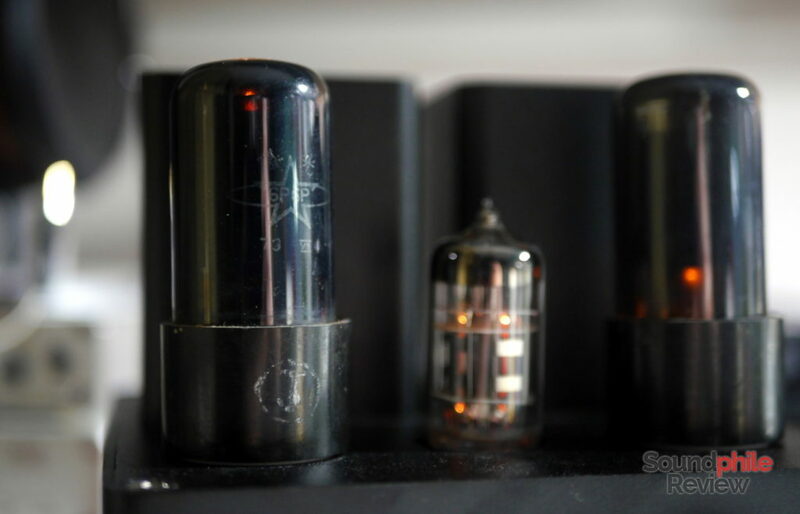 The top is also home to the tubes: two 6P6P (also compatible with 6V6) and one 6N4 (compatible with ECC83, ECC803 and 12AX7). The front hosts the aforementioned volume knob, made of machined aluminium, the gain switch (L/H) and the output port – a 6.3 mm jack socket. On the back we find the power switch, power input, fuse and two RCA connectors for signal input. The APPJ PA1502A appears rather compact: it is just 15 x 15 x 12.5 cm, so it can easily fit most desks – it is not too much larger than a solid-state amplifier such as the Topping A30, though it is of course taller. What’s impressive is the weight: despite its small size, the APPJ PA1502A is 2.5 kg, which is quite a bit – it certainly is not portable by any means! Build quality appears more than acceptable: materials are good quality and seem to be resistant and durable, with good assembly and acceptable attention to detail. My only complaint in this field is that the left transformer shell is chipped on top. That’s a very minor issue, and a cosmetic one specific to my unit moreover, but that is no excuse. Everything else appears good, especially if we factor in the price. Despite being a tube amplifier, operating temperatures are moderate, and even after a few hours of operation the main body of the amplifier is just warm to the touch. Tubes, on the other hand, run rather hot! That is especially true for the two 6P6P, that become burning hot (no, really, touching them is almost guaranteed to burn you – been there, done that). The warm operating temperature is a testament to the good quality of the amplifier. The volume knob is not perfectly smooth and it feels like there is some varying resistance when turning it; it generally has the right amount of “weight”, but it is highly inconsistent with sudden “bumps” that make it a bit harder to turn. I do not know whether this is due to the potentiometer being used or due to the knob itself rubbing against the amplifier due to low tolerances, but the latter seems the more probable option. 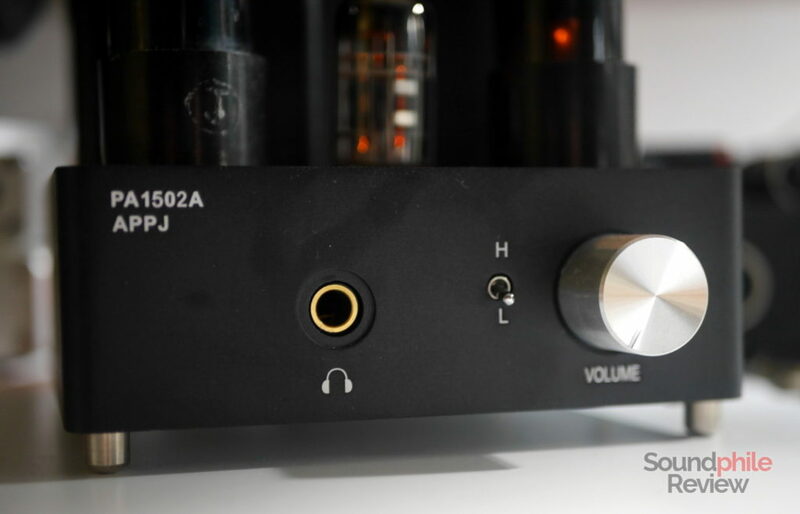 The APPJ PA1502A is a pure headphone amplifier, meaning that it cannot be used as a preamplifier to add some “tubeness” to sound before redirecting the signal to another amplifier, e.g. a speaker amplifier. Alas there is little information about the technical specifications of the APPJ PA1502A: most data is missing, and even crucial information such as output impedance is not known. Considering this is a tube amplifier, however, I would not bet on output impedance being low – tubes are typically not great at delivering lots of current with large swings. APPJ declares frequency response to be 30 – 30,000 Hz, which leaves the lowest notes out. We’ll delve into that topic later in the Sound section. The company claims supported impedances range from 8 Ω to 600 Ω. I question this claim from a practical perspective, as the power output is 1 W at 32 Ω – so it is not really usable with lower impedance headphones, unless you want to blow your eardrums. I tried using low-impedance headphones (i.e. Meze 99 Classics, 32 Ω) using the gain switch on “L” and that was too much even with the knob at 8 o’clock (and it starts at 7!). The only viable option with low-impedance headphones is to use a device such as the iFi Ear Buddy or iFi IEMatch to reduce the volume! I coupled the APPJ PA1502A with a Topping D30, using standard-resolution FLAC files as source (with a few hi-res tracks here and there). Headphones used to test it were the Sennheiser HD 6XX, Meze 99 Classics, HiFiMAN HE-560, 1More Triple Driver Over-Ear, Venture Electronics Zen 2.0 Omega Edition, Venture Electronics Asura 2.0s, Linsoul BLD and IMR Acoustics R1. I used the amp for more than 50 hours, which should be enough for the break-in of tubes. I often used an iFi IEMatch with lower-impedance headphones to keep volume at tolerable levels. A small note on the choice of headphones to test the APPJ PA1502: I tried to choose as wide a variety of headphones types and impedances as possible. As you may note, I also used the HE-560 which is planar, despite the general rule that goes like “planars do not play well with tubes”. I have to say that the PA1502A does a good job at driving the HE-560, without any significant issue – I can hear no clipping nor distortion, although I may listen to lower volume levels than many (I usually can’t stand volume levels beyond ~80 dB) and everything seems to sound good. If my experience is of any indication, the PA1502A should be a good match for most planars, given how hard to drive the HE-560 is. On the other hand, I tried it with IEMs such as the IMR Acoustics R1 and found the PA1502A works well with them, but may be a bit too powerful – an attenuator of some kind may be necessary. As it is, meaning without rolling tubes, the amplifier is almost neutral in its sound signature. It lacks the usual warmth that makes people love tubes, in the sense that it does not emphasise bass and lower midrange, and instead it appears almost neutral and balanced. Not that there are no effects, though: bass is a bit muddied up and this results in a signature that is not always clean, plus there is some influence on midrange and treble. At first listening this doesn’t appear like the usual tube amplifier, so I suspect tube rolling is the only way to make it sound “tubey” and “gooey” as some like. Again, though, the use of tubes is not there just for the looks. There is in fact some substantial influence on the sound signature: bass is in fact a bit more robust than on the average solid-state amplifier, but mainly because it is a bit distorted. The main difference, however, is in the upper midrange and treble area: it is slightly recessed, especially in the lower treble region which appears “warmer” than on solid-state devices, and this is what makes it a bit “tubey” (and why I wrote it is almost neutral). As for the frequency response, I can’t – obviously enough – test the upper limit of 30,000 Hz, but I can test the 30 Hz lower bound – and it is false, in the sense that between 20 Hz and 30 Hz I can hear no significant deviation from the output of a solid-state amplifier such as the Topping DX7. So the APPJ PA1502A actually outperforms the declared specifications, which is a nice bonus. A difference I can clearly hear when comparing the APPJ PA1502A to the DX7 and other solid-state amplifiers is instrument separation, which appears to be slightly improved: if we take bass away (as it is slightly distorted), the sound is much cleaner and clearer. 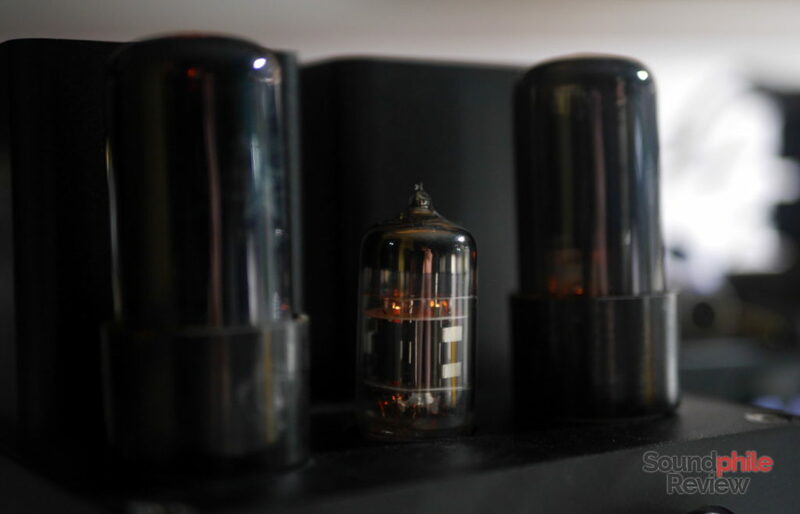 I honestly can’t wrap my head around audiophile terminology (not in English, but not even in Italian…) most of the time, but I guess that’s what people mean with “holographic” when they talk about tubes. Soundstage is also different – I can’t say if it is better or not, but it surely is different – as it is a bit wider, but most notably it is deeper and it acquires much better distribution in all three dimensions. Background noise is reduced to a minimum: there is a bit of hum caused by electrical noise in my system, but it is barely noticeable. 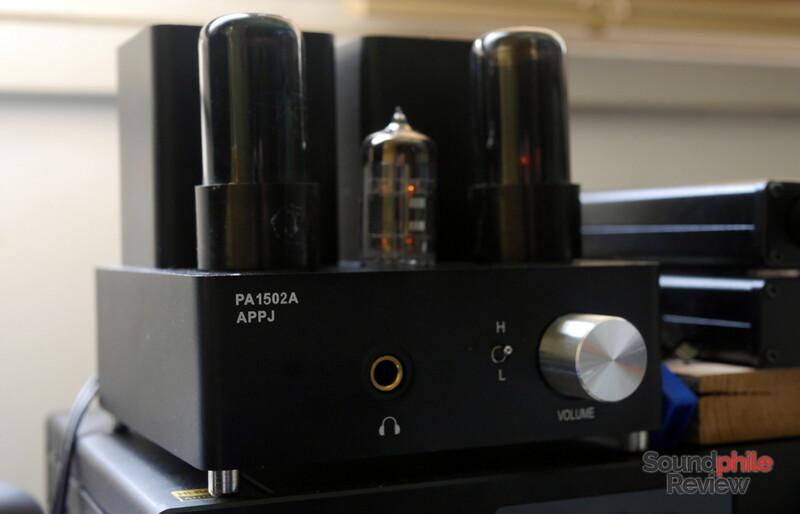 The APPJ PA1502A is a really nice amplifier. Considering it is sold at less than $200, and considering its good build quality, decent sound and high power output, the PA1502A is really worth the asking price – and maybe something more. There is a vast amount of modifications people have made to the device in order to improve its performance, and I am sure that a good amount of improvements could be made just by rolling the tubes. But even as it is, the APPJ PA1502A offers a very enjoyable listening experience. It is good with most headphones, too: the APPJ PA1502A works well with most headphones, ranging from IEMs to full-size planars. I feel fully confident in stating that the PA1502A is a device that can even meet the expectations of discerning audiophiles, and can be a sumptuous introduction to the world of tubes or a valuable addition to an already-built collection of amplifiers.